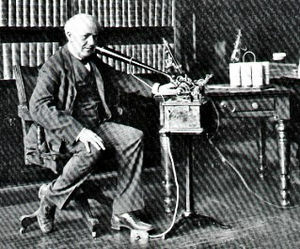 1907 image of Thomas Edison using a dictaphone. When Thomas Edison introduced the phonograph he didn’t think people would use it primarily for entertainment, he believed its primary use would be in business as a dictation machine. A dictation machine is a special kind of sound recorder, specially adapted for making voice recordings. Throughout most of the 20th century, dictation machines were used by business people to record “voice letters.” The records were sent to a secretary, who transferred them to paper with a typewriter. Edison thought that the business uses of the phonograph would be just as important as its entertainment uses, but time proved him wrong. 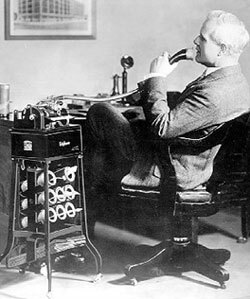 An executive using an Edison dictation machine, circa 1925. Courtesy: National Park Service, Edison National Historic Site. The earliest phonographs to be sold to the public appeared around 1890. Edison had invented the phonograph more than ten years earlier, but put it aside to work on other projects until 1888, when he invented the “improved phonograph.” This new machine used wax cylinders rather than tinfoil, and it was made for commercial use. These early phonographs could record and play back, but there were no recordings available for listening. Using it for entertainment usually meant making your own recordings at home and then playing them back. The phonograph was also expensive and difficult to use, and it needed regular maintenance, which lessened its appeal as an entertainment device. 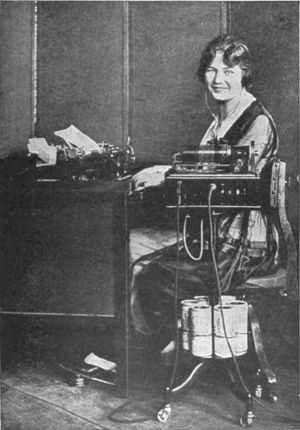 1922 Columbia Phonograph Company image of a woman who is transcribing dictation from a dictaphone wax cylinder. But once pre-recorded music became available in the early 1890s, the use of the phonograph in the home for entertainment took off. However, the “business phonograph” was still available from Edison’s company and from a competitor, the Columbia Phonograph Company. 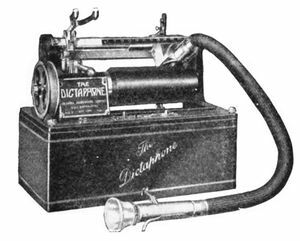 Edison’s phonograph and Columbia’s product, called the Dictaphone, eventually became the most successful dictation machines on the market. The home phonograph evolved into a device that could play records but not record them, and the original cylinder record gave way to the disc, but that was not the case with the dictation machine. The wax cylinder was the easiest, least expensive way to make a voice recording, and wax cylinder Dictaphones and “Ediphones” were available until about 1950. After that time, the new technology of magnetic tape recording pushed the old wax cylinders aside and they were finally discontinued. During the 1960s and the 1970s, many new kinds of dictation machines appeared, and some engineers began looking for ways to use computers to digitize their recordings and convert them directly into documents. However, software to do so was not generally available until the late 1990s. By that time, the use of the dictation machine had declined. Dictaphone wax cylinder dictation machine. During the 1980s, most people began using personal computers to create letters instead of recording them and having them typed. Today, doctors in hospitals are the largest group of dictation machine users. This is because they spend a lot of time away from their offices, but take notes all day long. They often use dictation equipment that records their messages from a telephone. Later, a typist accesses those recordings and enters the data into a computer. If office dictation is ever to make a comeback, it will probably not be in the form of desktop machines like the ones Edison invented, but rather in the form of software that runs on a personal computer.